Apart from being the home of the Irish Lotto, the Emerald Isle is also a place filled with myths, legends and superstitions. Let’s take a look at some of the most famous Irish myths and legends which have been passed on from one generation to the next. Everybody is familiar with St Patrick’s Day, a day when the world loosens its tie and sinks a few pints of the black (or green) stuff! Well according to legend, St Patrick not only introduced Christianity to the Pagan Irish but also drove all the snakes out of Ireland, which is why Ireland is one of the very few countries in the world which is serpent-free. Irish fairies or ‘faeries’ are far from the good-hearted sorts mentioned in Peter Pan and similar tales. The Irish version are known as ‘the little people’ and have traditionally been treated with wary respect. You can still find mounds of earth which are known as ‘fairy forts’ and which in the past were regarded as dangerous places to go near. Irish fairies traditionally bring nothing but bad luck to any humans who go near them, so are best to be avoided. The ‘banshee’ is another member of the faerie family in Ireland, and another which is probably best avoided! The banshee is a shape-shifting female creature, who can appear alternately as an ugly old crone or a beautiful young woman. Whichever form she takes, she will make her presence known by a shrieking wail which is said to herald the death of a family member. For that reason, you really don’t want to hear the wailing woman in action in the deep of the night! Okay, we couldn’t leave this topic without mentioning those little guys with the funny hats. Stories of Leprechauns have been commonplace since the middle-ages, and they are reputed to be a type of fairy. Rather than the Disney type of fairy, these chaps appear as old men and have a liking for gold, which they keep stored at the end of a rainbow. Catch a Leprechaun and he has to take you to where his stash is hidden! There are easier ways to get your hands on golden riches than trying to snare mythical little people. 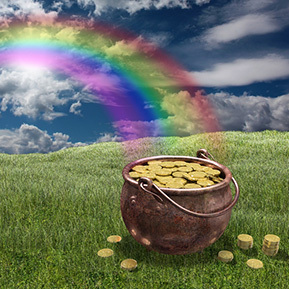 Place a bet on the Irish Lotto and we can say with confidence that you have a much better chance of winning large stacks of cash than by going out hunting Leprechauns!